Are you hitting the road with your family pet in tow? It’s a really big undertaking but can be a lot of fun for the whole family if done correctly. So what do you need to know about taking your pup on the road with you? Dr. Coombs also notes that often people are concerned that the dog may distract the driver. He tells us that many provincial police officers will ticket a driver if they feel the dog’s presence is acting as a distraction, just as they would if they witness cell phone usage. Best to either have your dog safely confined in a crate while driving, or have them fitted with a body harness that attaches to a seat belt system. Then, if you choose to travel with the windows down, there’s no risk to your dog. Dr. Chip is a strong believer in pet insurance and has worked in an advisory capacity. Here’s his great advice! 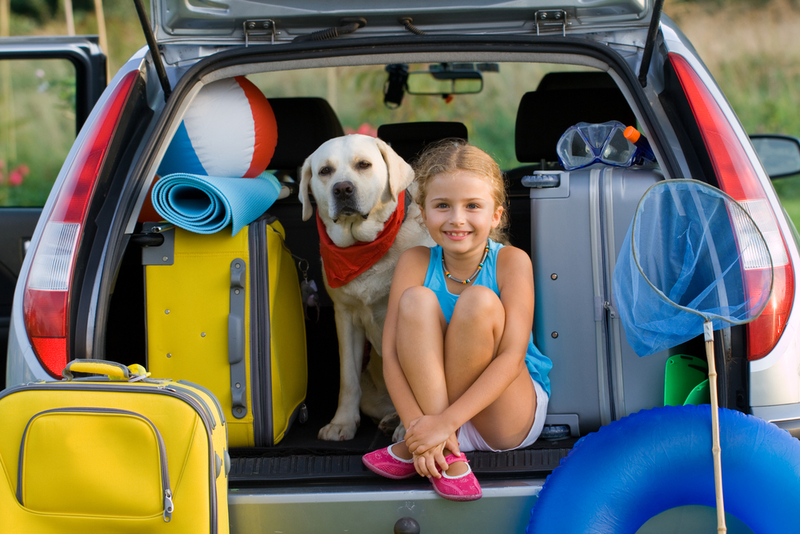 Whether your taking a short trip to one of our many great outdoor spaces here at home or taking a major road trip cross country, here’s a great checklist if you’re taking your family pet. Medications and check up: Before you leave on vacation consult with your vet and ensure your dog is in good physical health. 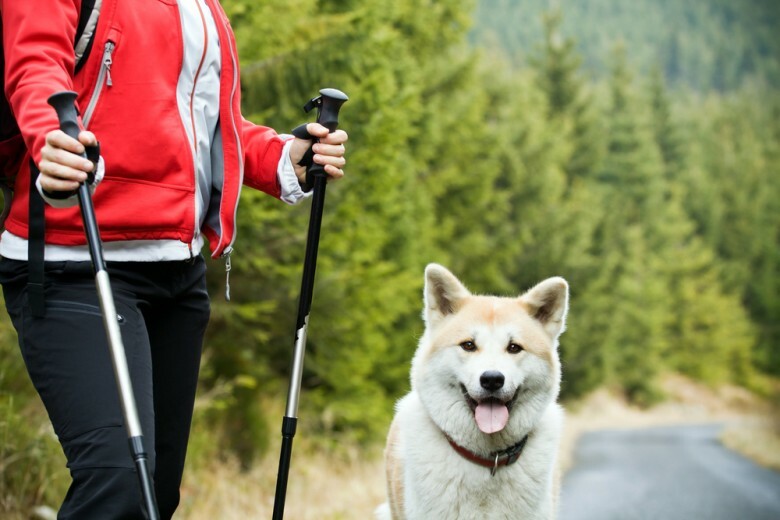 Pick up refills of any medications your dog will need while you are away and find out whether there are any concerns about the area to which you are traveling. For example, common medications include flea and tick control, and heartworm pills. If you’re pet is on medication or special food, it’s important to have them refilled so you don’t run out while travelling. Vaccination records and documentation: Be sure to check what types of vaccinations your dog will need, especially if travelling to another country and bring an up-to-date record of vaccinations with you. Also check with both your home country and destination to see whether there are any special requirements for either traveling into the country, or returning to your own. In some cases, you may not be permitted into a country without the proper records.If you’re planning on going into the US, you’re required to have a Health Certificate issued by your veterinarian within 1 week before you cross. Pet identification: Make sure to have identification on your dog and recent photo on hand, just in case your dog gets separated from the family. ID tags should include the dog’s name, your name, and a contact phone number. First aid kit: Purchase an animal first aid kit or assemble one yourself in case your dog encounters any injuries. Include sterile gauze pads, bandage rolls, first aid tape, a lubricant, styptic powder or pencil, a product that discourages dogs from chewing or licking where applied (like a ‘bitter apple’), cotton balls and swabs. Travel crate: Some hotels ask that you kennel your dog if you are leaving them alone in the room. A kennel is also a safe way for your pet to travel. Your dog should not ride loose in the back of a pickup truck or in the car, as they could fall out and suffer serious injuries. Be sure the crate is well-padded! Familiar foods: Keep your dog on their typical diet to help prevent the dreaded diarrhea or vomiting. If your dog has a sensitive stomach, you may also want to bring water; it will be easier to get your dog to drink if it’s familiar water from home. Water in different places can taste and smell different and they may not want to drink it. Research local pet by-laws: Dog owners should check local by-laws to ensure their breed of pet is welcome, and to find out what parks require your dog to be on a leash. You should have a leash on hand at all times just in case. Motion sickness: Try not to feed your pet within 3 hours of driving, as there is less likelihood of them becoming car sick. If your dog rarely travels in a car and you have a long trip planned, discuss the pros and cons of sedation with your veterinarian. In most cases, sedation is not ideal but also try a few shorter test drives to have a better idea of how your dog will handle car rides. Watch what they drink: Everyone knows drinking salt water is bad, except for your dog. 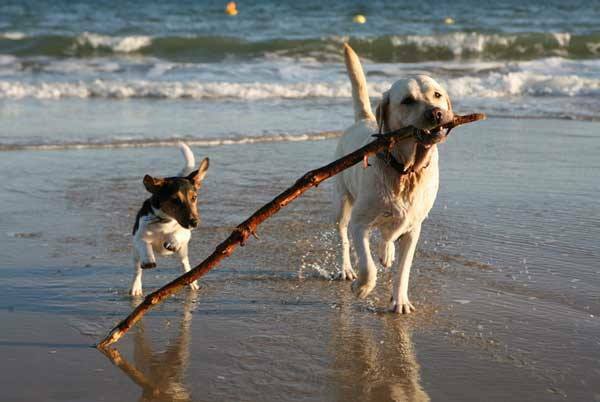 To prevent your dog from drinking beach water, never leave them unattended and keep a healthy supply of fresh water on hand. Mind the heat: Research has shown that an increase in a pet’s body temperature of two or three degrees can be fatal. The average internal temperature is 38 C to 39 C. At 40 C the animal needs to see a vet and at 41 C they can get organ failure and brain damage. If it’s too hot, head for some shade and cool down. Not all dogs swim: While most dogs have a natural instinct to swim, that isn’t the case for all breeds. Find some quiet, calm water and give your dog a chance to show you whether he or she can swim by encouraging them to follow you. Never throw your dog in the water and expect the best results. Protected paws: Hot sand, rocks, shells, and broken glass are all things that can injure your dog’s paws while at the beach. Because dogs often don’t indicate when they’re in pain, you’ll need to watch body language and carefully check for cuts and scrapes. It’s also a good idea to examine and rinse their paws after the beach visit. Get familiar with the area: New people and situations may spook even a calm, well-behaved dog. In addition, you may be unfamiliar with other animals, people or environmental elements in the area that could harm your pet. Keep your dog on a leash until everyone has become familiar with the environment.